There is no place like home and, if home is Barcelona, this saying has a whole new meaning. Every time someone asks where I am from the reaction is always overwhelmingly positive. They have either been there, know someone who has or are planning to go. If they have been, the “ohhhh” and “ahhh” are endless. It is justified. Barcelona really is a stunning city with history dating back to centuries B.C., a beach-like atmosphere, Mediterranean breeze and absolutely incredible food to match. What else can you ask for? As you may have guesses, I am biased. There is no doubt that Barcelona has something for everyone but on occasion of a friend’s visit I decided to put together this itinerary for 4 days in Barcelona which resembles what I usually show friends when they visit with me. This is the Barcelona itinerary I, a Catalan who grew up there, would recommend. It is not what an expat may suggest and it is definitively not what a guide will tell you to see, my idea was to suggest the best places to see in Barcelona from a local’s point of view including a bit of local flair, the most cozy and genuine bars and Barcelona’s best fine dining, now that the city finally have been awarded with its first 3 Michelin starred restaurant. Let me share the best four day itinerary in Barcelona and, with it, my city, my land, my culture. Below you will find an interactive map with all the tops and under it, the proposed itinerary to spend four days exploring Barcelona like a local. If you see a plus sign like this + it means you can expand the section to see more by clicking on it! Don’t miss out on this additional information! My favorite part of the city is the old part that used to be enclosed within the Medieval city walls. Today, you can’t see the walls anymore as there isn’t any vestige left of them in the open, but that part still looks and feels like it’s breathing the stories of centuries passed. A visit to Barcelona needs to start here, wandering aimlessly but consciously, along the darkish and narrow pedestrian alleyways and cobblestoned streets. Try one of these Old Town tours either on foot, segway or a photo tour! Etymologically speaking the word Cathedral indicates the seat of the dioceses’ Bishop from where he teaches the doctrine. Today’s Cathedral was built in several waves starting in the 4th Century A.C. There are paleo-Christian foundations, Romanesque accents and a decidedly Gothic facade as the building was mostly completed in the 1300s. The facade has eight stained-glass windows, some are modernist and others from the Renaissance. Get in and take in the ceiling, the tainted glass windows and, most importantly, the cloister which can also be accessed from a side street. If there is mass service ongoing you won’t be able to tour beyond the back of the church but outside of service hours you can walk all around and even down to the Crypt. The cloister is made of 4 galleries and surrounded by pillars flanking a garden with palm trees, magnolias, an orange tree and a fountain dating from the mid-15th century, where the traditional “ou com balla” (the dancing egg) takes place each year for the celebration of Corpus Christi. There is also a large pond in the Cloister which is home for the 13 white geese of the Cathedral. If you are in town on 3rd May you may be able to attend the Blessing of the District. At 9:00 am the municipal district of Barcelona is blessed from the rooftops of the Cathedral, on the occasion of the Day of the Holy Cross, for which the Cathedral is named. During Christmas the esplanade in front of the Cathedral is filled with stalls selling Christmas products, figurines and everything to build your nativity for the Santa Llucia Fair. You can also buy the funny “Shitter” figurine. Check out the opening, visit and confession times here. From Roman Barcino to today’s cosmopolitan city Barcelona has a long history of cultures and civilization occupying its land. The MUHBA conserves and promotes a series of heritage sites across the city that help preserve its history and past. A few of them are in the Gothic Quarter and well worth a visit. Stop by the Placa del Rei, adjacent almost to the Cathedral. This is the most interesting of sites because you can descend underground and visit the real, well-preserved Roman Barcino under today’s streets. You can walk along the Roman streets, see the houses they lived in and even some of the restored mosaics. It is fascinating to be able to step back a few thousand years underground and visit 4,000 sq meters of historical grounds. You can find more information here. If you are interested in a deeper visit of the other heritage sites under the MUHBA protection they have put together an itinerary here. If you prefer to explore the Gothic Quarter with the experts, I highly recommend Context Travel and their docent-led tours which I have joined in Tokyo, Florence, Rome, Singapore and Bangkok. Their Gothic Quarter tour will be the best intro to the city and will tell you all about its fascinating past. No better way to start off. The perfect mid-morning break. This is a hidden gem I am even scared to share with the world for fear of it being discovered. It is a unique tiny space hosted in a funky corner building that is so narrow it is just the width of this tiny slice of Heaven, literally. Caelum sells only sweets and products produced by monks and nuns in Monasteries across Spain hence their motto “Welcome to Haven”. Everything you will find here is not found anywhere else but the Convents and Monasteries themselves. The space gives the exquisite morsels of sacred cakes and wines the best home they could have. It is split into two levels, the one below called the Crypt, and it is as tiny as it is packed with love and healing recipes kept secretly by the men and women of God and passed down only to those privileged ones. You may be able to sample some of the more traditional sweets like those made with sweet pumpkin called “Angel’s hair” in Spanish, small marzipans or egg yolk sweets as well as other completely unique specialties like fried milk, bread of charity or the all saints Panellets, the almond and sugar pastries we eat only at the time of All Saints (last week of October). The political and cultural center of the city, Placa Sant Jaume (or Saint James’s Square), is guarded, on one side by the seat of the Catalan Government, El Palau de la Generalitat, and on the other, by the Town Hall of Barcelona. The uniform of the policemen at the entrance and the flags flying on their roof should tell you which one is which. The Catalan police, called the Mossos d’Esquadra, will wear the traditional Catalan barretina hat, similar to the French birret. El Palau opens its doors to the public on key days such as St. Jordi (23rd April), La Merce, the city’s patron saint (24th September) and on the Catalan National Day – 11th September. Outside of these dates one can request a free 1h guided tour on the 2nd and 4th weekend of each month by filling out this form. The Town Hall can be visited every Sunday morning for free. The square sees demonstrations and cultural events regularly. There might be human tower shows, fairs or other events and during Christmas the city’s Nativity is put on display for the citizen to enjoy . From Placa Sant Jaume take Carrer Ferran down towards Les Rambles and wander inside the Placa Reial on your left. Built in the 19th Century, check out the fountain in the middle and the lanterns, designed by Gaudi. The Square can be packed with pick-pocketers as it is a popular place in the evenings so be careful. Some of the city’s famous clubs are here and it is lively at night with all the outdoor terraces. Get off track just for a second to have lunch at La Boqueria, the beautiful most famous wet market in the city. Built in Modernist times over a market that may date back to Medieval traditions it bears strong resemblance to any Modernist design. Look up to the sign with its name and the colorful stained glass. Wander around but don’t be a tourist by just taking photos of what is, essentially, a working market where stall owners make money from selling their produce not from the many photos tourists take. 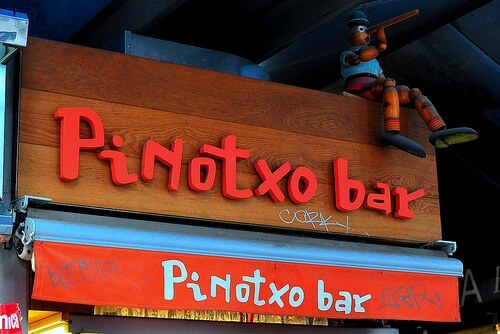 Find a seat at Bar Pinotxo for lunch. This tiny stall serves traditional Catalan food based on what’s seasonal and found at the market. It is the ultimate market cuisine. Most of the times, the owner, Juanito, serves you whatever he wants so don’t be surprised if he just dishes out a portion of what is on the menu for the day in front of you. This could include pulses, sausage, stews, squid, etc. Here the strategy to get a seat is informal to say the least. Nobody keeps a waitlist of the people waiting for a table so just hover around until seats become available and just take them but beware of others who arrived before you. People come here to eat, so it is common etiquette to leave as soon as you are done with your meal so you should not wait for long. Or, be smart, and come outside typical lunch hours (ie before 1pm or after 3pm). If you come too late there may not be much left. The owner is lively and noisy and the food is hearty and real. He will always wear his bow tie and vest and he is definitively an institution although the word is out for years and plenty of tourists will drop by and mingle with the regulars. Juanito has not given in to the tourists though and continues to behave just like he did 15 years ago when I was a university student so it is still worth a go. Better yet, visit La Boqueria with a chef and learn all there is about food in Barcelona with a food tour. Retrace your steps back to Carrer Ferran and venture left towards the old Jewish “call” Quarter. The Jewish people of the area contributed immensely to Barcelona’s cultural flourishment and some of the building are very well preserved. Look around for two nice landmarks: Sant Felip Neri square and Pi square. Sant Felip Neri is a tiny square that is hard to find because it can only be reached through a narrow alleyway off the Neri Hotel, a Medieval Palace that oozes history. The square’s walls show the remnants of the Spanish Civil War. Look out for the holes left by the fragments of a bomb dropped during the War which killed mostly children who sought refuge inside the church of the same name. La Placa del Pi is a much more lively and joyful square shaded by a large pine tree that gives it its name. It is famous with Bohemians and artists and arts and crafts fairs or individuals painting or sketching are commonly seen. Although it is not exactly hidden, it is less popular than other squares and still largely inhabited by locals. Check out the church of the same name Basilica del Pi, for their summer and winter guitar concerts. Don’t miss the chance to go up to the bell tower, the first opened in Barcelona for amazing views. This is a commercial and historical street that used to be one of the main entrances to the Medieval city walls. The word porta means gate and this gave entrance to the second wall of the city built in the 13th century. Ferrissa derives from the word iron and referred to the longitudinal iron bar used to keep the door closed. The street is lined with alternative stores. Wander inside a few of them and note that some are as historical as the street although, sadly, slowly disappearing in favor of the deep-pocket international brands. You will see old stores selling hats, pastries and an old pharmacy as well as new Bohemian shops. 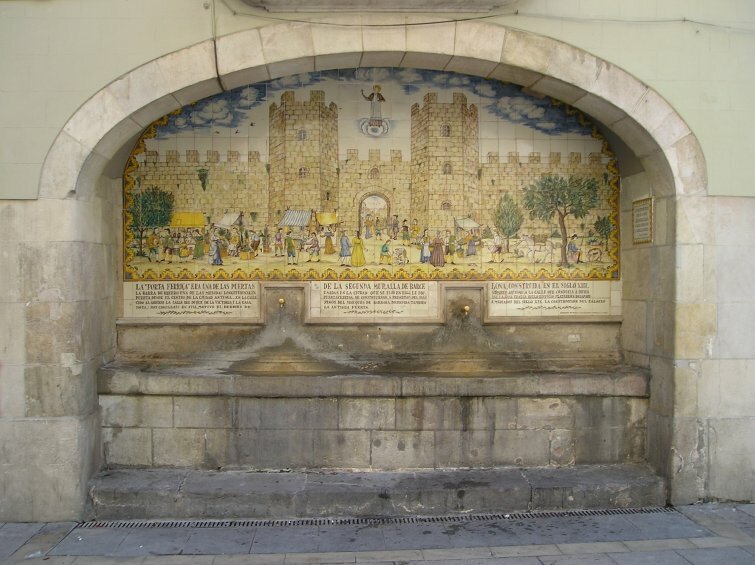 At the end of the street, when it connects with Les Rambles you can see the tiled walls of a heritage fountain that explains the story of the door. It would be a good time to take a rest and enjoy a quintessential Spanish mid-afternoon tea break of churros and hot chocolate. Remember that we eat late in Spain so the mid-afternoon snack is essential to make it through the day and until 9pm (or much later in the summer) dinner time. 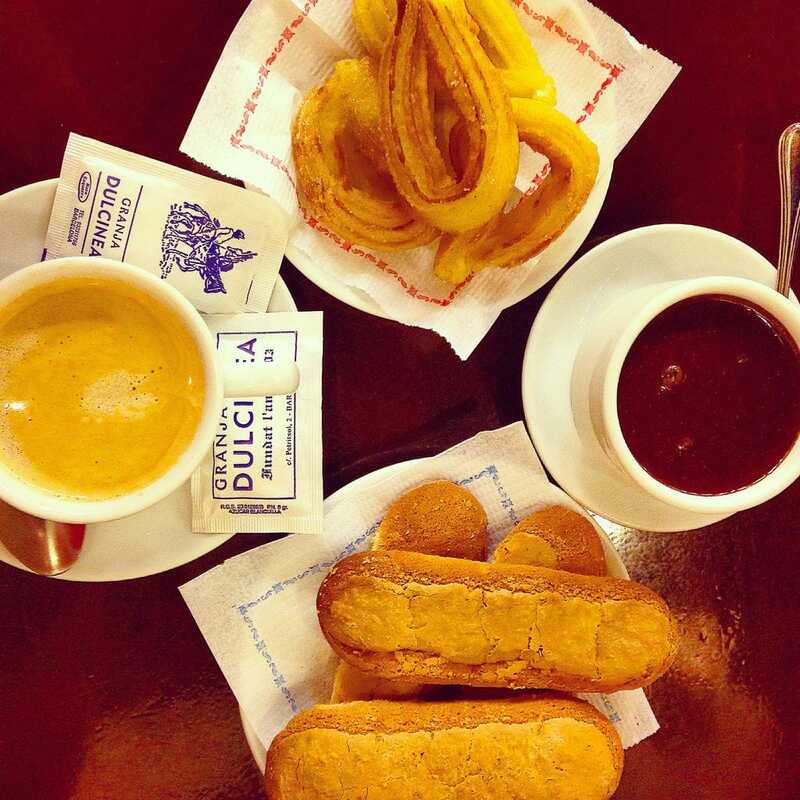 One of the most famous and longest running institutions to serve the famous sweet is Granja Dulcinea, near Placa del Pi. Step inside and you are immediately transported to the childhood of most Catalans. Wooden chairs, narrow spaces, low ceiling, painted tiles and the best sweets. Go for the churros or for the ensaimadas, a powder-sugar topped soft pastry that you can also dip into the thick chocolate. And remember, the hot chocolate we eat in Spain is not liquid but thickened with maiz flour. In Spain we buy it in individual sachets or in pots where the mixture is already made. It needs to be thick so it can properly cover the churros without making them soggy. Better yet, join a chocolate and churros tour to taste a few and learn all there is about this famous snack. Here’s a short table summary of all my favourite picks. Everybody knows La Rambla, it is no doubt the most famous part of the city. It is colorful, lively and always busy no matter what time of the day or night. I will only give one piece of advise: be careful of your belongings. Almost everyone I know whose wallet has been stolen in Barcelona was wandering without paying attention along La Rambla. It is the place to get robbed. It is not dangerous, just hold on to your possessions because there are too many ill-meaning crooks that will make your wallet literally disappear. For locals, Passeig de Gracia is more famous than La Rambla which is not really a place you go for your day-to-day needs but more for a Sunday stroll. This is the main commercial artery of the city. All the luxury and high-street shops are here plus two of Gaudi’s most famous buildings. Start off at Gaudi’s La Pedrera otherwise known as Casa Mila for its owners, an impressive wavy building on the upper part of Pg. de Gracia declared UNESCO heritage site in 1984. It represent’s the artist’s last piece of civil architecture and hence his culmination. The entire building draws from nature, like most of his constructions. Do not miss the auto-guide and get a tour at your own pace. If you need to refuel before the active day ahead, take a moment at the cafe on its ground floor which has views onto the light patio. Skip the queue with these Casa Mila tickets and audio guide below. Pair them with a visit to the nearby Casa Ametller inclusive of a chocolate tasting which is what the family who owns the building is known for. Carry on down Pg. de Gracia towards Casa Batllo on the other side of the street and make it inside, no matter the queues, to go on a self-guided visit of the most beautiful Modernist building, in my opinion. I have been at least 3 times and every time I marvel at the incredible beauty and magic of the place. La Casa Batllo dragon rooftop, its inner patio or the many incredible small details make it a surreal work of art that could only be conceived by a genius. What makes Casa Batllo unique is also the use of color and the various stained glass windows. This is a masterpiece. Can you imagine living there? This was always someone’s house today turned into a Foundation. Next to it don’t dismiss La Casa Ametller, also a piece of Modernism architecture and very pretty as well, reminiscent of the almond trees in bloom where it gets the name. After Casa Batllo continue down the street. Wander into any of the shops if you feel like it. With the euro so devalued everything feels even cheaper! All the main Spanish brands have stores here. For lunch you may stop at either Txapela, a Basque montaditos and tapas place on the left of Pg. de Gracia when walking down or at the Pans & Company‘s outlet next to Casa Batllo. They sell the famous sandwiches we eat in Spain using crunchy baguette type of bread. Choose any of the classics like a jamon or fuet cured sausage sandwich or go adventurous with any of their ongoing creations. See how many of the cold sandwiches are spread with fresh tomato rubbed against the bread. This is the traditional way of making a sandwich in Catalunya and a very unique custom. Then some virgin olive oil and the best cured meats. My childhood on a plate. Get your fast-track Casa Batllo tickets and video guide below. Add a tour of Casa Ametller, alongside Casa Batllo, which is equally stunning and is known for the nice cafe at the ground floor (recommended before in this post) which serves lovely hot chocolate as the family owning the building is in the chocolate business. At the bottom of Pg. 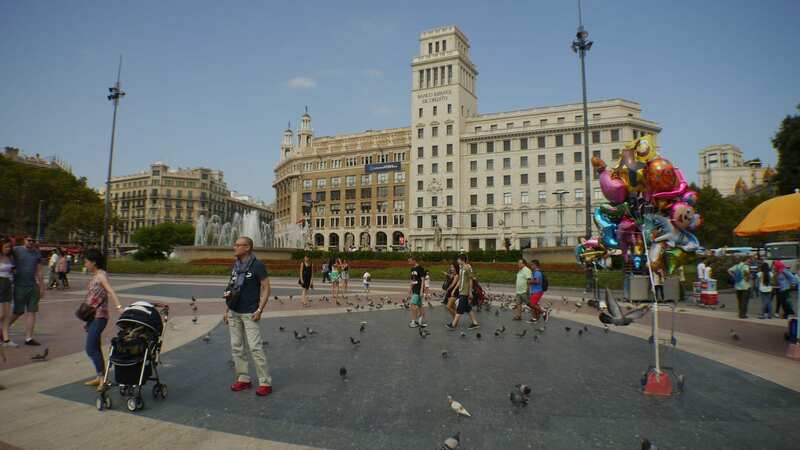 de Gracia you will be met with Placa Catalunya, what many consider the center of the city. One of the main buildings that have become an institution is El Corte Ingles. A large department store that sells anything and everything El Corte Ingles was made famous because you can buy and return, no questions asked, anytime. At the square you can buy food to feed the pigeons who will come in hordes to eat from your hand. If you need any tourism info the Tourism Office is under the square, as is the metro and the Police. While you can visit all of Gaudi’s buildings above plus Sagrada Familia on your own or even with specific guides per landmark, the most amazing way to explore all of them is by joining a specialised day tour of Gaudi’s architecture. This tour really excels and you get an expert in architecture and Gaudi putting it all into perspective. I am sure it will exceed all expectations. From Placa Catalunya make your way down the 1km long promenade until the Port. You could be wandering around the area for an entire day depending on how much you want to take in and simply people-watch. Look at the kiosks and flower stalls that make Les Rambles so famous and so beautiful. Check out all the artists along the way. There will be painters, performers of all sorts and, most likely, human statues in all shapes and forms. This has become something of an art and some of them are so perfect they are unreal. Drop a coin to see them change position. • Canaletes fountain – At the very top of Les Rambles you will find the very famous fountain where all of FC Barcelona’s triumphs are celebrated by thousands of fans: La Font de Canaletes. It is only a tiny fountain but it is the place where fans come to after a victory. This is because the newspaper La Rambla which stood in front of the fountain used to publish the results of every game in the early 1930s and so fans would flock to check the scores after a game. They also say that if you drink from the fountain you will return to the city. • Casa Beethoven – This is a mere music store selling music scores but some of them are so old and so beautiful it is paradise to music lovers. • Columbus Monument – At the end of Les Rambles stands Christopher Columbus who chose to disembark from Barcelona on his return from America in 1492. You can go inside and up to a viewpoint from where the city looks imposing and splendid. You will see the Gothic Quarter, the beach, the sea and the port. Magnifique! Opens everyday from 8a30am to 830pm. Come back up from Columbus and venture inside the Raval Quarter. This is the sort of red light and immigrant district of the city well off-limits to most people when I was a child. Today the area has been re-born as a center for Bohemian, alternative artistic expressions and all sorts of what makes Barcelona so unique but still remains the main District for immigrants, especially of Muslim and Arab descent. You can find cafes whose furniture comes from dumpsters. Drug dealers and prostitutes may still be quite visible on the corners and the bottom part of Les Rambles at night. Although not dangerous, you may be put off by the constant “offering” of services. The word Raval derives from the Arabic Rabad meaning neighborhood. Historically, el Raval attracted immigrants because of its proximity to the port and because it was the location for the first factories to be housed at the beginning of the industrial revolution. The area is also called, until today, Barrio Chino, or Chinese neighborhood, since the term was coined, for the same reason, in 1930s. Since the 90s the government has done major efforts to clean up and relaunch the area by opening two very relevant art centers: Centre de Cultura Contemporània and MACBA (Museu d’Art Contemporani de Barcelona). You will see teenagers on skateboards, artists enjoying a drink on any of the lazy pedestrian squares and streets and several creative spaces and innovative restaurants and bars. It is hipster’s paradise. The best is to simply walk along the streets and get into the MACBA for its regular exhibitions that push the boundaries. At Carrer Tallers, at the top end of the Raval, you will find all of Barcelona’s alternative record stores and music lovers. A visit to Barcelona is not complete without a Gaudi day out to his two most stunning constructions: Parc Guell and Sagrada Familia. In Catalan, when somethings seems to take very long, we say it is like Sagrada Familia. Most may never see its completion although latest estimates put that date in 2030, almost 150 years since it started. This is because the most incredible cathedral in the world is built still according to Gaudi’s drawing and interpretations, but with donations from the public and the ticket sales. No words can describe Sagrada Familia, you have to see for yourself. Book tickets in advance to avoid the queue that is always permanently there and take the auto-guide. Go up to one of the towers for views and to see the architectural masterpiece from the air. This is a place that will stay with you forever. Sagrada Familia was Gaudi’s long-life project and its main facade and crypt are designated UNESCO World Heritage Site. Today a consecrated Cathedral Sagrada Familia can host masses. More a host of information including opening times, history and background, read my comprehensive guide here. Get your fast-track ticket to Sagrada Familia below. For a more leisurely day that also includes insights into what makes the city a foodie destination I would dedicate today to fine dining and experiential cuisine. Barcelona has many Michelin-starred restaurants and a long tradition in being at the forefront of international cuisines trends including molecular cuisine. The city only has two 3-Michelin starred restaurants, several with two and a few with one. • Enoteca – Housed in the Ritz-Carlton hotel’s ground floor Enoteca is another Mediterranean-inspired restaurant and chef’s Paco Perez’ third Michelin masterpiece. The restaurant is also famous for having a wine list containing over 500 names. Try one of the local Catalan wines from the Penedes region for a complete local experience. • MOments – I have spent every Boxing Day here for the past few years and MOments, directed by the son of awarded Carme Ruscalleda, is a wonderful restaurant serving traditional Catalan cuisine with a twist. Hosted inside the Mandarin Oriental Hotel on Pg. de Gracia it is an airy room with views over the lobby and an internal tiny garden. Golden ceiling and thick carpets give it a warm feel. It is down to Earth and non-ostentatious and it never disappoints from the moment you arrive and are greeted until you leave after most likely, chatting to the chef directly, you are sure to have made the right choice. Come here for takes on traditional Catalan dishes that have been given a modern take. The city also has a long list of restaurants with 1 or 2 Michelin star. I would highlight Cinc Sentits, which puts emphasis on Proximity food, as well as Disfrutar, from the chefs at elBulli which have received a wave of awards including a Michelin star within their first year of operation. I very much loved their creative, deconstructed cuisine of traditional Catalan dishes. You can read my review here. Also worth checking out, if you manage to get a booking, is Tickets, Ferran Adria‘s venture after his 10-year Best Restaurant in the World elBulli closed down its doors. Roca Moo, at the Ohm Hotel is Roca brothers outpost in Barcelona offers great experiences in the heart of the city. Via Veneto, Hofmann, Neichel and Gaig are helmed by well established Barcelona chefs that have owned awarded restaurants for decades. Dos Cielos and Angle are other innovative options. This is a public park like no other. It reminds me of my adoptive city’s Gardens by the Bay in its colors, its brave take on nature and its uniqueness. Park Guell is an oasis away from the city. Located up on the hill it provides a unique view over the urban sprawl and the sea. The entrance is greeted by the famous dragon made with Gaudi’s popular “trencadis” technique of broken pieces of ceramic in all colors and it has become a symbol of the city souvenir industry. The park is large and split over several levels. Make sure to wander up to the balcony made with an undulating series of benches covered with the same pieces of broken ceramic as the dragon. Note how the park is called after the English word Park instead of Parc which would be the Catalan equivalent. This is because the owner wanted to design an city-park mimicking he English versions. The final project was never completed but the park remains one of Gaudi’s most colorful and fantastical designs. Since 2015 access to the monumental part of the park is now controlled via ticketing to preserve the area from the thousands of visitors. Buy online for discounts and to avoid queues which can run into an hour or more. During the high season, if you do not buy tickets in advance you will not be able to get them at the entrance as they will be sold out so plan ahead. The park is designated UNESCO World Heritage Site. Get your Park Guell admission ticket below. For dinner I would explore another of the city's many awarded restaurants or head to Monvinic. Today should be a relaxing day with a bit of Bohemian undertones. Start off at El Born walking from Via Laietana into Carrer Princesa towards Santa Maria del Mar Cathedral. This architectural masterpiece is as important as the Cathedral. Walk inside too for a real tour. If you’re there in the summer months and on a weekend you are almost guaranteed there will be a wedding ceremony taking place at noon and throughout the afternoon. Continue walking along the cathedral towards the main promenade. Right beside the cathedral you will find El Fossar de les Moreres, the Catalan tribute was the site of the graveyard for the fallen during the 1714 Siege of Barcelona. A monument stands on the site as a reminder. The place sometimes goes unnoticed by visitors. For the Catalans, the fossar is more than a memory. It is a homage and the place authorities come to pay their respects on National Day which is the day the city finally fell to the siege in 1714. If you continue along you will reach El Paseig del Born. Born, in Catalan means jousting field and this is the square which hosted tournaments and jousting matches. This is where merchants, artisans and guilds used to be located so there is a long tradition of commerce here. Vogue called El Born “the Brooklyn of Barcelona” and it does have a bit of that artsy feeling. The street names conserve the original trades as guilds were grouped by areas. Here you can find artists studios and galleries and one of Barcelona’s most important museum: Picasso Museum. Although not a city native Picasso spent a long time in Barcelona and his most important works we housed here. For opening times check here. Have lunch at Mercat de Santa Catalina on your way down where you can order any of the typical Catalan market dishes on offer. From el Born descend towards the sea following the breeze and the smell of the port. La Barceloneta was the fishermen’s town no longer in use. The sea meets the city here among fishing boats, charters, large luxury cruise ships and private yachts. In 1988, in pre-Olympic days, the decision was taken to demolish the old beachfront restaurants, known as xiringuitos, and public baths, heralding a process of opening the city up to the sea. That part of the city changed dramatically with the Olympic Games in 1992 which started a new phase for Barcelona to catapult into today’s stardom and cosmopolitan city. Today, the area is oozing charm and modernity and the beach is always packed with locals and tourists alike. What other European city has such easy and direct access to the beach? You’ve earned a relaxing afternoon walking along the sea board or enjoying a bit of sun. Have a drink at one of the bars and make your way towards the Vila Olimpica, the area that housed the Olympic athletes during the games. Find the Hotel Arts for reference and enjoy dinner at any of the terraces at beach level underneath. Barcelona is a city that faces the sea and life very much revolves around the mediterranean so what better way to truly live the city than by taking one of the tours below which will take you right out into the sea. Depending on how tired or inclined you are there are a few other places that are well worth a visit. If Barca is playing get tickets, this will be a memorable experience. The Museum is also open to visitors and it is the most visited museum in Europe, but what truly shows the atmosphere of the stadium is watching a game. Get your jersey on, wear warm clothes in the winter and a hat if you're not under cover and get ready to cheer together with almost 100,000 other fans. Camp Nou is the second largest stadium in the world and the whistling and shouting of the crowds or the beautiful mosaics built with individual pieces of cardboard held by everyone are something very unique and emotional to any Catalan. If you can't see a game (or even if you do), make sure to get tickets to visit the stadium and the museum or even better, book a private tour and get a chance to touch the grass and see the tunnel where the players access the stadium and their changing rooms. Barca, is more than just a Club, it is the identity of Catalunya and the Catalans. The Maremagnum, in front of the Columbus Monument is a nice area to shop around on Sundays when everything else in the city is closed. The architecture is very unique as well and makes for a pleasant walk. Montjuic is the small mountain by the sea that hosted the Olympic Stadium, the flame and the various competition grounds. It is also home of the city's cemetery on one side and to the Museu Nacional d'Art de Catalunya (MNAC) where you will be able to see Medieval and older pieces of art from religious origins. Next to it there is also the Fundacio Miro. The Magic Fountain that leads up to the MNAC is used for lights and water shows perfectly choreographed to beautiful songs. Performances happen occasionally during the summer months but the most important one is the show used to close the celebrations of Patron Saint, La Merce, on the 24th of September which also includes fireworks. It is an exquisite show and extremely beautiful. The most famous of them was the show put together for the Olympic Games when Soprano Montserrat Caballe and Freddy Mercury sang the theme Barcelona to celebrate the city's choice as the 1992 Olympic Games destination. You can see the video here. If you are Catalan, you can't watch this video without shedding a tear. The song was released in 1987 but Mercury died before the Olympic Games opening ceremony although the recording was still played. Most of my Barcelona itinerary calls for walking. Barcelona is a walkable and temperate city with mild weather all year round. It pays to walk so you can fully take in a city that should be lived. If you get tired though, take the metro or a bus. You can find the bus routes on any of the bus stops. It will tell you the ones stopping at that particular stop and their Barcelona itinerary. You can interchange between bus and metro within a 1h period with the same ticket without having to pay again. And if you just want a quick ride, take a taxi, they are not so expensive. Here are all the best hotels in Barcelona to stay at. And don't forget to hop over to my home town of Sitges for more beach and coastal fun. Here is my complete guide as well as some other day getaway ideas from Barcelona here.